We can all agree, at Easter time there must be an abundance of eggs. The egg is synonymous with Easter as it represents new life, new beginnings and a welcome reminder that springtime is finally here! These no-bake rice crispy egg pops make for quick and easy treats, they're great for kids and adults alike and offer an alternative to the traditional chocolate egg. Serves 6 to 8, depending on the size of your cutter. 1. Grease and line an 18cm x 25cm tray bake/mini roasting tin. 2. Place the butter and marshmallows in a heavy-based saucepan and melt over a low heat. Stir regularly until completely melted and smooth. 3. Add the puffed rice and stir to combine. 4. Pour the mixture into the prepared tin, the mix is very sticky at this stage so be sure to use a spatula to help the mix along. 5. Place a further sheet of greaseproof paper over the top of the mix, this helps to avoid sticky fingers. Press down firmly with your hands, ensuring the mix is nice and flat and reaches into all the corners of the tin. 6. Allow to cool completely in the fridge for an hour or so. 7. Once the mixture has set firmly use an oval shaped cookie cutter to cut into egg shapes. 8. Insert lollipop sticks to complete! Different coloured marshmallows will result in different coloured eggs. For example, combining yellow and pink makes for a lovely shade of pastel peach. Swap rice crispies for in chocolate crispies for a chocolate finish. Add pops of colour with 100s and 1000s, sprinkle these over after step 6. And for speckled eggs add two tablespoons of chocolate chips and stir through with the rice crispies. Though simple, this can be messy - before washing up give the saucepan a good soak first to dissolve the marshmallow, rather than scrubbing. 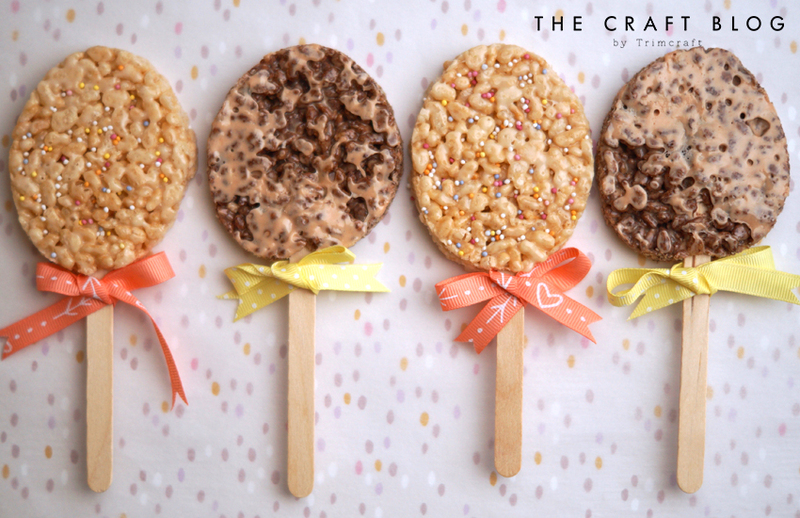 Will you be making Elle’s Easter Egg Pops? We’d LOVE to see if you give these a try, so don’t forget to #Trimcraft and tag @elle_jane_ when uploading to social media and to share your yummy makes in the Inspiration area. Yummy my granddaughter will love these, in fact so will Nannie!